What do you think about when you watch a dance performance? These dances were on the bills of larger programs, but I single them out because they prompted me to think about patterns, and nuance, and most of all, the complex marshalling of bodies in space. Oh, and they both featured bravura performances from excellent dancers. PNB Principal Dancers Jerome Tisserand and Carrie Imler in Ratmansky's "Concerto DSCH"
Ratmansky’s “Concerto DSCH” isn’t new to PNB’s repertoire; the company first presented it in 2011. I don’t remember loving it then. Certainly not as much as I loved it this time around. Set to Shostakovich’s Concerto No. 2 in F. major, (wonderfully performed by the PNB orchestra with pianist Christina Siemens), “Concerto DSCH” is crafted in three parts: sprightly opening and closing sections sandwich a wonderfully tender pas de deux, performed by the most excellent Karel Cruz and Carla Korbes. “Concerto DSCH” is a big work, with a bevy of dancers. Carrie Imler, Jerome Tisserand and Seth Orza, a sassy trio in blue, threw out wickedly challenging leaps and spins like they were the easiest moves. And they punctuated their technical competence with so much fun; playful jabs and sideways glances at one another. PNB company members in Ratmansky's "Concerto DSCH"
It was bittersweet to watch departing corps members Raphael Bouchard, Eric Hipolito and Jahna Frantzikonis, as well as retiring soloist Kiyon Gaines, dancing their hearts out with fellow company members. 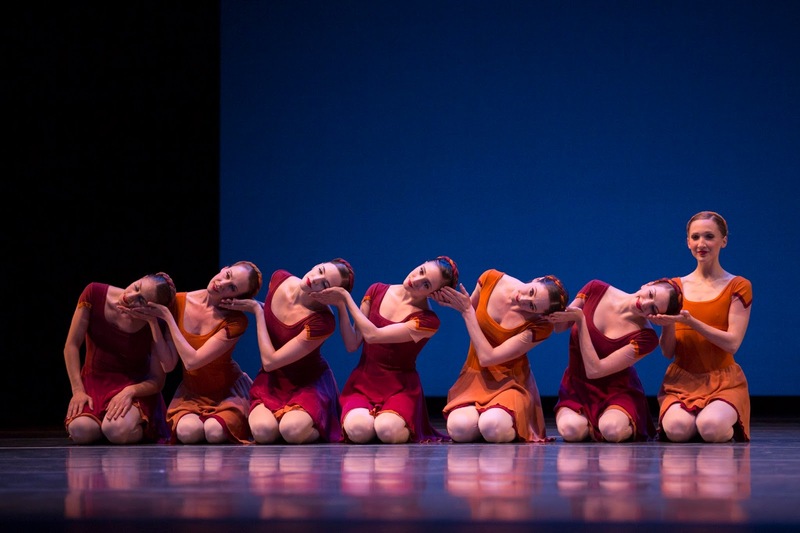 They were all crisp and clean, and they made Ratmansky’s complicated fugue of a dance clear and accessible. Korbes and Cruz were a dream; in contrast with the other two movements of this Concerto, their duet is inward focused and contemplative-they danced a couple saying a tender goodbye to one another. But it felt as if they were also dancing their offstage emotions; Korbes was giving one of her last PNB performances with her regular partner Cruz. It was exquisite both technically and emotionally. PNB Principal Dancers Carla Korbes and Karel Cruz in Ratmansky's "Concerto DSCH"
Aside from fine performances, “Concerto DSCH” provided a great chance to appreciate how a choreographer deploys dancers in the service of a piece of music. Or perhaps, the dance and the music were mutually dependent, and seen and heard together, they are more than the sume of their parts. Ratmansky used Shostakovich’s intricate composition as inspiration for an intricate ballet; at points, you have to choose which dancers to watch-the trio stage left, or Carrie Imler, who is teasing us with saucy sautes. 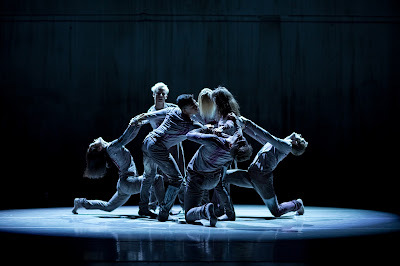 Vignoulle set “RIPple…” on Whim W’him’s seven company members, and they blast out of the gate from the get-go, Tory Peil twitching and vibrating at such frequency you fear she might implode on the stage. She doesn’t. Vignoulle pairs her with Whim W’him’s newest dancer, the fantastic Justin Reiter, in a duet that displays both their discipline and virtuosity, as well as Peil’s amazing strength. Loved it when she lifts Reiter and spins him around. Whim W'him in Manuel Vignoulle's "RIPple efFECT"
“RIPple efFECT” is high-energy, a continuous swirl of acrobatic action. There are also moments of rest (luckily for the dancers), and quieter contemplation. 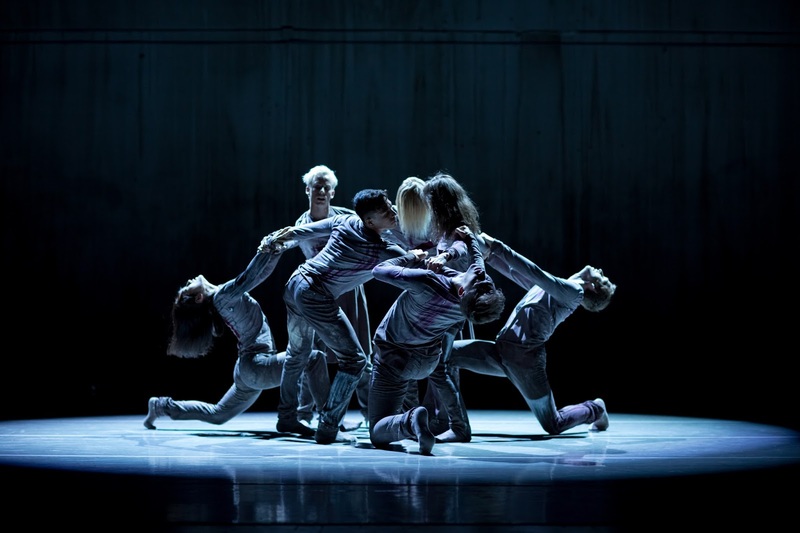 In the second section, for example, all seven dancers join hands in a circle, then move in and out, up and down, reminiscent of a sea anemone that pulses with the tide. Whim W'him company members in Vingoulle's "RIPple efFECT"
Whim W’him Artistic Director Olivier Wevers has made it standard practice to include other choreographers on his programs. Manuel Vignoulle’s work was new for me, and a welcome chance to revel in his artistic vision. So, thanks for that Olivier. I see a lot of different kinds of dance. And I never know how what I see will touch me, how it will move me. I do know that last weekend’s two very different dance programs fed my mind and my spirit. I really enjoyed this place and you can definitely find me here for more events. I didn't eat anything when on my recent visit to venue NYC, but those around me had truffle fries, pizza, and wings all seemed to enjoy.